Manager Allan Johnston was left cursing his Kilmarnock side's lack of cutting edge after they slipped to a 2-1 defeat at Ross County. Filip Kiss' first-half goal and Richard Brittain's penalty sent the Staggies in front with Kris Boyd replying late on. 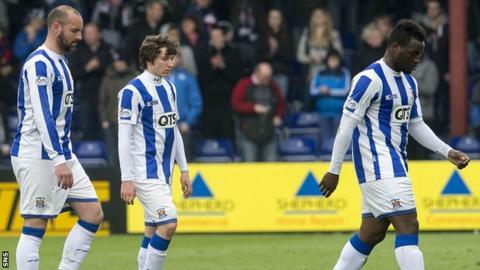 The defeat leaves Killie in the Premiership relegation play-off place, with three games left of the campaign. "We had a lot of possession but the complaint you could have was the end product," said Johnston. "That final pass was missing today, the quality crosses into the box, or testing their keeper with shots. "We had the bulk of possession, although towards the end when we were pushing forward they caught us on the counter-attack a couple of times. "We had a lot of pressure in the second half, but the one good quality cross we got into the box, we got a goal from it, so it shows what we need to improve on. "If we improve on the quality into our strikers, someone like Kris Boyd is invaluable to a team like us." The Rugby Park side have now lost three league matches in a row, and Johnston knows they need to snap that run. "It's how you react to the defeats. There's no point dwelling on it, we've got to learn from the mistakes we're making and ensure we come out on top in the next three games," he added. "There's a nervousness in games like this, every team is the same, and it's whoever handles that the best. "I don't think one win is going to be enough in the run-in."